Friday, September 10 5 – 7 p.m.
Monday – Friday 10 a.m.- 4 p.m. Saturday, September 11, 10:30 a.m. – 2 p.m. Saturday, September 18, Noon – 4 p.m.
An extraordinary exhibition of abstract art, presented by Art Beyond Tradition, opens at the Arts Center of Coastal Carolina on Hilton Head Island, SC on Friday, September 10, 2010 with a reception in the Walter Greer Gallery from 5:00-7:00 PM. Thirteen fine artists are presenting their latest works including paintings in oils, acrylics, watercolors and collage, as well as sculptures in stone. The following day, Saturday, September 11, the artists are holding a coffee event at the gallery beginning at 10:30 AM to walk the public through the show, explaining their artwork. The show continues through September 24. Admission to the gallery is free, and all the artwork is for sale. 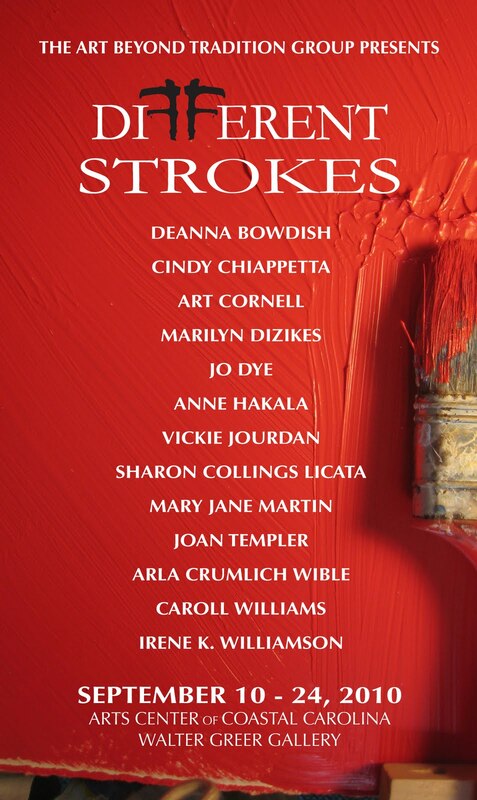 Artists participating in this show include: Deanna Bowdish, Cindy Chiappetta, Art Cornell, Marilyn Dizikes, Jo Dye, Anne Hakala, Vickie Jourdan, Sharon Collings Licata, Mary Jane Martin, Joan Templer, Arla Crumlick Wible, Caroll Williams, and Irene K. Williamson. The Art Beyond Tradition group of abstract artists was formed in 2005 and held its first exhibition the following year at the Arts Center. The extraordinary collection of abstract art was reviewed as one of the most exciting, colorful and unique presentations on Hilton Head Island. The gallery was ablaze in color, design and ideas. Showing every two years, the second show, also at the Arts Center, was held in 2008, and the presentation of “On the Edge” was another overwhelming success. The 2010 show, “Different Strokes,” lives up to its title in a variety of ways. Once again, the artwork is totally new, totally abstract and totally unique. Over the years, the artists have honed their skills, expanded their vision and delivered a strong statement of their art that is way beyond the traditional. Each artist brings new ideas and different strokes to this show. Marilyn Dizikes, an award winning artist who has had some of her work traveling the state in the SC watercolor exhibit last year, has created unique paintings influenced by recent travel in Greece. She describes her work as speaking the universal language of art. The basis for individual artist’s work is a reflection of their lives, where they lived, where they studied and places they’ve loved. Deanna Bowdish, is an artist and art gallery owner. Her work focuses on the sparing essentials of color, shape and texture. She creates bold tactile surfaces dragging color in progressive, deliberate layers with a wide range of created and found tools. Deanna pursues vibrancy in her art by playing on the struggle between structure and chaos. The Walter Greer Gallery at the Arts Center in Shelter Cove is open Monday through Friday from 10:00 a.m. till 4:00 p.m. On Saturday, September 11, the gallery is open from 10:00 a.m. till 2:00 p.m. and Saturday, September 18 from noon till 4:00 p.m. Admission is free. For more information call the Arts Center at 843-686-3945. The Arts Center of Coastal Carolina is a non-profit performing arts organization that also oversees two art galleries and conducts regional arts educational programs.